A Partner Church is a church that is in a committed ministry partnership with United Methodist Volunteers in Mission for the Southeastern Jurisdiction. The church agrees to support the ministries of UMVIM, SEJ by communicating information about UMVIM, SEJ to the congregation, continually praying for the ministry and providing financial support. 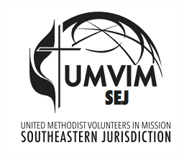 In turn, UMVIM, SEJ pledges to keep the congregation updated, both in person and via our UMVIM, SEJ publications of how the church’s gift is transforming the world. UMVIM, SEJ will also keep the church’s ministry in their prayers. Annual gifts from Partnering Churches are vital to the continued success of UMVIM, SEJ. Your church’s supporting relationship enables us to equip and connect additional volunteer teams to serve around the world. With your continued support, together we will exemplify Christian Love in Action. For more information as to how to become a Supporting Church, email sejinfo@umvim.org. The UMVIM, SEJ Partnering Churches are vital to the continuation of our ministries. Every effort has been made to ensure that the list of 2016 Partner Churches is both accurate and complete as of February, 2017. We apologize if your church has been omitted, misspelled or otherwise improperly reported. Please contact us at 205-453-9480 so we can correct our records.